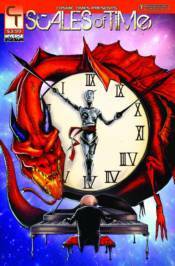 Cosmic Times & Inverse Press join forces to bring you Robot Vs. Dragon for the prize of one man's immensely talented soul! In Scales of Time, a rapidly aging virtuoso pianist is bent beneath the heel of a Draconian patron but finds freedom at the hands of a time-bending automaton with her own unknown agenda. Scales of Time is a one-shot, self-contained comic.